What do you do with those shoes that cannot be repaired or donated for someone else to use? Here are a few ideas to give your old shoes a new purpose in life! ∞ Give them to a friend or community member. We have been fortunate to get hand-me-down shoes from several people. We appreciate them so much! ∞ Good Will or Salvation Army – Find the nearest drop off site and drop off these and other items. 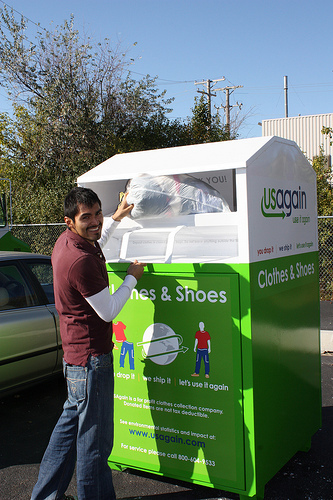 ∞ UsAgain – Donate your used clothing, shoes, and household textiles to these bins that can often be found at local recycling centers and schools. Check their website for locations. The items are then distributed and sold around the world. ∞ Soles4Souls – this program distributes shoes to needy people, including victims of natural disasters. They have given shoes to people in more than 127 countries. ∞ Share your souls – This is another program that donates shoes to impoverished people all over the world. ∞ Nike Reuse-a-Shoe – I have mentioned this program before. They take old athletic shoes and turn them into various athletic surfaces. Scroll down the page to click on Reuse-a-Shoe to find nearby drop-off locations.